And if you are interested in getting accessories (Flip covers, TPU Cases, Spare Batteries, Chargers, Docks, etc) for your brand new Samsung Note II LTE (Congratulations!! Welcome to the Note II LTE Family!! ), you can check them out here. Most of the items are available for WorldWide FREE Shipping !! Hello Singapore Friends and Fans Of The Samsung Note 2, With the anticipated official release date of the Samsung Note 2 LTE in Singapore drawing nearer (some say 19th October, some say 20th, some say 13th …), I have another exciting finding to share!! 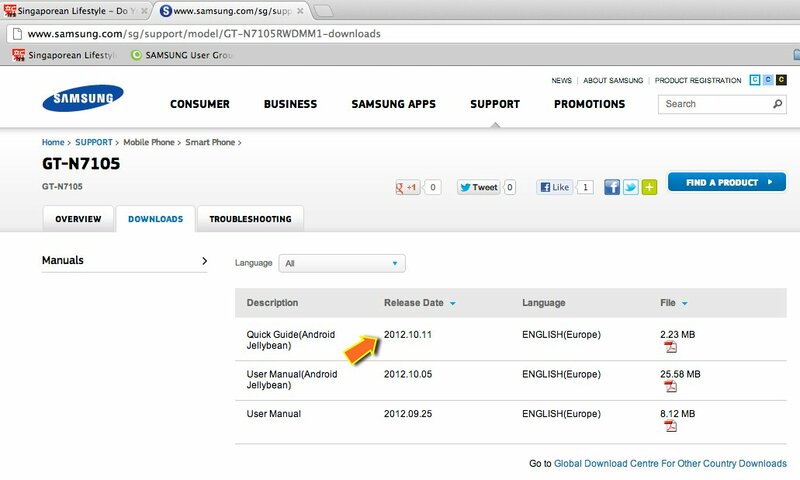 I was searching around the Samsung Singapore website (www.samsung.com.sg) to find the specs and more information of the local Note 2 LTE (and hopefully dig some release date announcement), but found this instead : The pdf file was deposited yesterday (11th October 2012). If you are interested to check out these manuals before you get your own set of Samsung Note 2 LTE in Singapore, you can download the pdf manuals from here. Getting these from the local site could only mean the date is drawing nearer!! The official release is definitely going to be this month (October 2012), and with the Official Galaxy Note II LTE Fans Exclusive Preview in less than a week’s time (18th October 2012), we are all getting real excited about it. A new update for the User Manual was deposited yesterday – 12th October 2012, BUT.. it is linked to the wrong file, currently it is showing the S III LTE pdf.. Anyway.. GOOD NEWS !! You can pre-register your interest for the NOTE II LTE from our 3 major Telcos (M1, Singtel and StarHub) now! !